A special Safari & beach package. A captivating escape to the Seychelles combined with a spectacular finish at Singita Lebombo Lodge in South Africa. Experience unique & refreshing destinations on this unforgettable African journey. Your safari experience: Situated on Intendance Bay in a private corner of the Indian Ocean, is one of the world's most beautiful beaches. It is here, amid swaying palm forests and breathtaking hills that Banyan Tree Seychelles Resort offers an exclusive spa retreat. Enjoy distinctive Seychelles architecture of the colonial plantations accented by airy contemporary respite and exotic ethnic styling. The villa interiors offer a true sense of place to experience Banyan Tree's mark of romance, rejuvenation and exotic sensuality, that is uniquely Creole. Then, fly out to South Africa for an exciting safari adventure at the exclusive Singita Lebombo Lodge - one of Africa's premium luxury safari destinations. On arrival in Africa, experience personalized welcome and private transfer assistance by the Guided Safaris team. On arrival at the Banyan Tree Seychelles, a welcome drink followed by quick, guaranteed check-in on arrival service sees you to your exquisite Beachfront Spa Pool Villa, set amid perfumed gardens with direct beach access to the inviting sea. 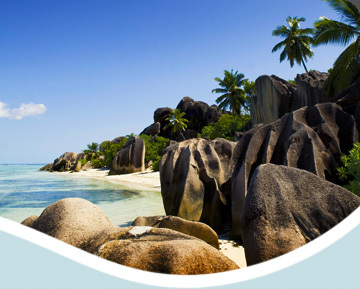 Intendance Bay has been voted as one of the world's most beautiful beaches with its giant granite boulders, sensual pink sand and dramatic cliffside tropical forest background. It is here that the private villas of Banyan tree Resort sprawl amid rocks and lush surrounds open to panoramic views and natural orchestra of the birds and powerful sea. The Beachfront Spa Pool Villa offers deluxe amenities for your exclusive use: a Private pool, Private spa pavilion, garden with living and dining area, pool sundeck with king-size sun loungers, outdoor jet pool, steam room, spacious master bedroom with king-size bed, His & Her vanity and bath and direct beach access from your villa. Enjoy preferential seat allocation and worldly comforts aboard the Air Seychelles Pearl Class service. Sample culinary delights from International and Seychelles Creole cuisine and private in-seat entertainment from South Africa to Seychelles. Set in a swanky neighborhood in one of Africa's most exciting cities, The Saxon hotel in Johannesburg is an impressive retreat for a night's indulgence. The Saxon redefines the ultimate in state-of-the-art African luxury and boutique elegance, world-renowned for outstanding amenities and unparalleled hospitality. It was at The Saxon's luxurious grounds that former President Nelson Mandela wrote his international bestseller: A Long Walk to Freedom. Your deluxe accommodation at the Egoli Suite features a romantic open-plan bedroom with elegant bathroom. The ultimate escape, The Saxon Spa and Studio was voted the Best Day Spa in South Africa 2006 by Les Nouvelles Esthétiques and named Top 100 City Spa in the World 2007 by Tatler UK. Spend a leisurely afternoon at the spa or at nearby Nelson Mandela Square for an eclectic experience of cosmopolitan Africa and return to the hotel for a decadent dining experience at the award-winning Saxon restaurant. Singita Lebombo concession is one of the most game prolific regions in South Africa. Located in a private game reserve in the North of Kruger, the concession is reserved for the exclusive use of Singita guests. Singita Lebombo Lodge features just 15 luxury suites dramatically perched on the mountain-side to offer panoramic views of the beautiful and gamerich riverine forest below. Knowledgeable and experienced rangers take you on extraodinary game drives through the pristine wilderness. Gourmet meals are served with the finest South African vintages from the Singita Bush Cellar. A Singita Spa, Gym and African Gallery are also offered. Singita Boulders lodge offers one of the finest luxury African safari experiences in the world. Unmatched by any other resort for their first-rate service and elegant accommodation facilities, your African wildlife adventure at Singita will be an unforgettable travel experience. Awake at dawn to embark on exciting safaris that lead you into the heart of the Sabi Sand in a private 37000-acre game reserve to encounter lion, leopard - all the plentiful game - in a natural African eden. Our exclusive Into Seychelles signature safaris feature romantic indulgences with an extra special flair throughout your stay at Singita Game Reserve: From Private Bush Dinners under the African sky, surrounded by hundreds of lanterns, romantic suite turndowns with freshly-drawn bubble-baths, to private wine tasting at the luxurious Singita bush cellar, you will be pampered at Singita Boulders Lodge with a true 'Out of Africa' experience...with compliments of Into Seychelles.